Perennial herb from a taproot; stems erect, branched, rough-hairy, 10-80 cm tall. Basal leaves oblanceolate, long-stalked, toothed or shallowly lobed to entire, long-hairy above and below, the blade up to 15 cm long and 3 cm wide; stem leaves reduced and becoming unstalked upward. 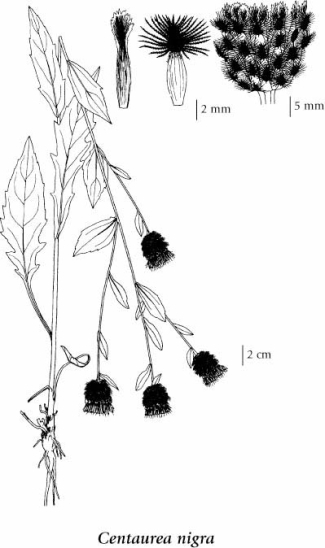 Heads discoid, few to several, solitary at the ends of erect branches; disk flowers rose to purple, rarely white, the marginal ones not enlarged; involucres 12-15 mm tall, nearly as wide; involucral bracts with enlarged, broad, rounded, comb-like to tattered, black to dark brown appendages at the tips, these wider than the bracts. Achenes compressed, light brown or light grey, sparsely hairy, 3-3.5 mm long; pappus in several series, about 1 mm long, rarely lacking. Mesic to dry roadsides and fields in the lowland and montane zones; rare in S BC south of 51degreeN; introduced from Europe. Centaurea nigra var. radiata DC.